We browned 1 pound butter and put it in the cooler until hard then cut into small cubes. On lowest speed 1/2 teaspoon xantham gum is added slowly to water, increase speed and slowly add hardened brown butter until emulsified. Ricotta salata, ground toasted walnuts, fresh sage, nutmeg and a generous amount of Parmigiano-Reggiano. Take dehydrated potato skins and pulverize in spice grinder into powder, set aside. 1 tablespoon Minus 8 Dehydr8 late harvest vinegar, set aside. Fry a handful fresh sage leaves in olive oil until crisp, set aside on paper towel. 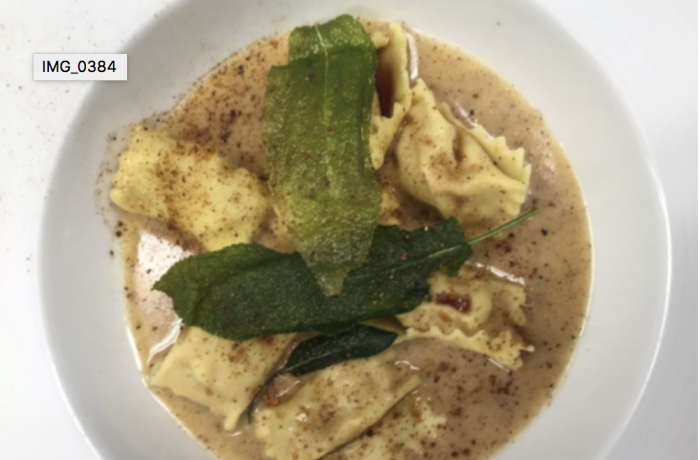 Boil agnolotti and place on brown butter beurre monte.